Pictured: Jude Bricker, Sun Country CEO, at the expansion plan announcement. Sun Country Airlines recently announced plans for a major route expansion that will grow the airline and add jobs at Minneapolis-St. Paul International Airport (MSP). The network expansion includes eight new seasonal nonstop routes for MSP and eight new seasonal nonstop routes in recently expanded markets including Nashville, Tenn., Dallas-Ft. Worth and Portland, Oregon. The airline is also adding nonstop destinations from Las Vegas and adding San Antonio and Providence, R.I. to its network. The announcement is the largest addition to Sun Country’s network in the company’s history as a scheduled service airline. The new routes are part of an overall growth plan for the airline that will include additional aircraft and a 10 percent increase the company’s Twin Cities workforce in 2019. 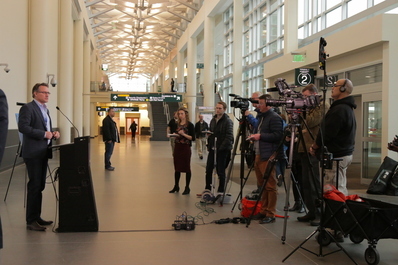 At the announcement on Jan. 8 at MSP’s Terminal 2, Brian Ryks, the CEO and executive director of the Metropolitan Airports Commission, noted the additional options for travelers and the new jobs. “Sun Country has the second-largest presence among air carriers at MSP, and these additional routes demonstrate our hometown airline’s commitment to growing its business here in Minnesota,” Ryks said. Minneapolis Mayor Jacob Frey spoke of MSP’s impact on the region’s economy, and noted that Sun Country’s expansion will provide good-paying jobs for the Twin Cities. Chris Tolbert, a St. Paul City Council member, also spoke at the event and congratulated Sun Country on its new service. Several of the new routes will begin service in April. With these added routes, Sun Country will operate a total of 86 routes across 53 airports, marking a nearly 40 percent growth in routes served since June of last year.